This week, ’tis the season to take inspiration from a holiday classic. One with a timeless story from a masterful author that reminds all of us, across the ages, what the holidays are all about: being generous and celebrating with the ones we love. It’s Charles Dickens’ A Christmas Carol! 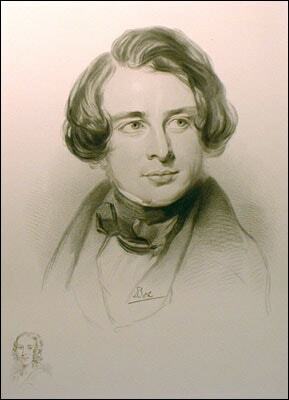 A Christmas Carol was originally published in 1843 by renowned British author Charles Dickens. The novella details the story of a miserly businessman Ebeneezer Scrooge, whose bitter heart and unmerciful practices summon the ghost of his old partner Jacob Marley, as well as the spirits of Christmas Past, Present, and Yet to Be, on a bitterly cold Christmas Eve. These four spirits amend his lack of holiday cheer by showing him the ill effects of his ways, the toll they will eventually take on his life, and how goodwill and kindness far outweigh his penny-pinching. Dickens was already an established author by the time A Christmas Carol was published; however, due to a conflict with his publisher, he funded the book by his own means instead, and a string of problems followed. In spite of these difficulties, as well as with meager profits, Dickens could hardly be disappointed by the strong critical and public responses in support of the holiday tale, as well as with the fact that the book has never been out of print. A Christmas Carol has been adapted into a number of productions, be they for stage (an opera, ballet, and various musical iterations) or screen (any number of the film or television versions of the classic story). However, despite the variety of iterations of the tale, the setting almost always remains steadfastly in London, England, at the time of the novella’s publication. This is most likely because of the impact the novel had at its time in shaping the holiday practices of the Victorian Era. When A Christmas Carol was published, England was already undergoing a sort of renaissance in terms of re-invigoration of Christmas traditions and return to the deeper-set cultural practices of the Pre-Cromwell period. These practices included the inclusion of Christmas trees in the home, the exchange of greeting cards, and door-to-door caroling. By integrating some of the key elements from the novella into your own looks, you, too, can celebrate the season while inflecting a little Victorian sensibility into your wardrobe, as well. Product Information: Headband – Asos, Tights – Asos, Dress – H&M, Jacket – Target, Boots – Forever 21. The Victorian era saw a lot of change in terms of fashion styling. Towards the beginning of the age, specific trends had already begun to emerge, with the growing popularization of lace and excessive embellishments on clothing. Though less expensive with the invention of the locked-stitch sewing machine, these still served as a demarcation of class and worth, a strong theme in the many works of Dickens. Take inspiration from the early portion of the Victorian time period, where girly ruffles and lace, fitted jackets, and lace up boots were the norm. Trends like lace embroidery, pale dresses, and hair accessories get updated in this look with a white lace skater dress, a ruffled peplum jacket, black patterned tights and suede wedge lace-up booties. Top it all off with a pearl-and-flower headband. 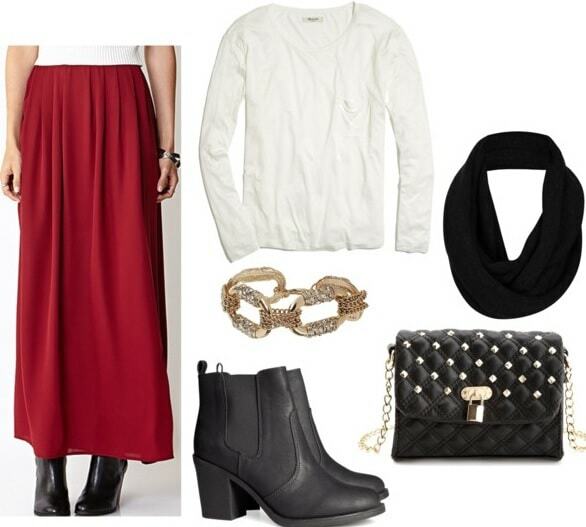 Product Information: Maxi Skirt – Forever 21, Shirt – Madewell, Scarf – Nordstrom, Bracelet – Dorothy Perkins, Purse – Charlotte Russe, Boots – H&M. In fact, A Christmas Carol isone of the most notable of such tales, and is accredited with popularizing the idea of a ghost who “rattles chains,” which originated in the character of Jacob Marley. Integrate these terrifying tidings into your own holiday wardrobe by utilizing pieces inspired by the ghosts themselves, as well as what they represented in the story. The Ghost of Christmas Present takes center stage with a deep red skirt, while the Ghost of Christmas Past is displayed in a basic white tee. The Ghost of Christmas Yet to Be is shown in a black infinity scarf and foreboding black boots, while Jacob Marley himself is included in the hardware of the chain bracelet and lock-and-chain crossbody bag. Product Information: Lipstick – MAC, Shirt – Modcloth, Necklace – Debenhams, Pants – Delias, Boots – Aeropostale, Tote – Zara. Naturally, I would be incredibly remiss in discussing A Christmas Carol so close to the holidays without including a seasonally-appropriate look, too! However, here is the beauty of the story: while it explicitly holds ties to this holiday (I mean, it’s in the title), the morals and lessons of the story aren’t exclusive. Within the novella, “Christmas” represents a specific sense of love, happiness, and goodwill towards men. So, when Scrooge announces as the end of the novel, “I will honour Christmas in my heart and try to keep it all the year,” it is directed towards his new change of heart, not the holiday itself. It isn’t the ties to the holiday that make it a classic – it’s the novel’s strong moral fiber. Celebrate the season in style with an outfit that lends itself to season’s greetings, but whose pieces are versatile enough to be worn throughout the year. 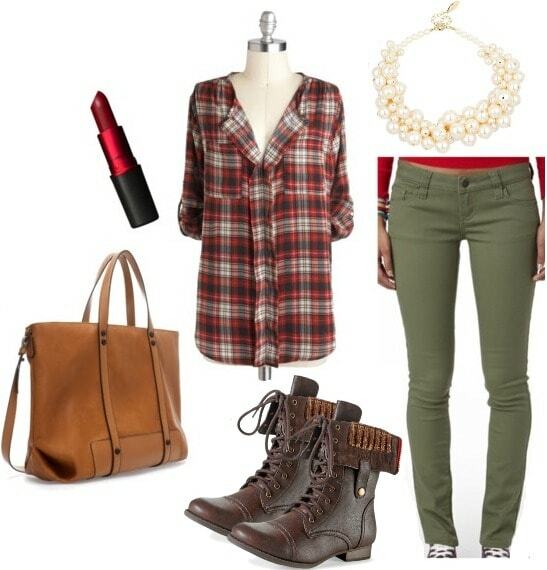 Olive jeans and a plaid shirt call forth the colors of the season, while a pearl necklace and sweater-lined boots add interest. A leather tote bag has enough room for you to stash the presents for everyone on your list, while MAC’s Viva Glam lipstick supports charity (a portion of the proceeds sold from the Viva Glam line goes towards those affected by AIDS). 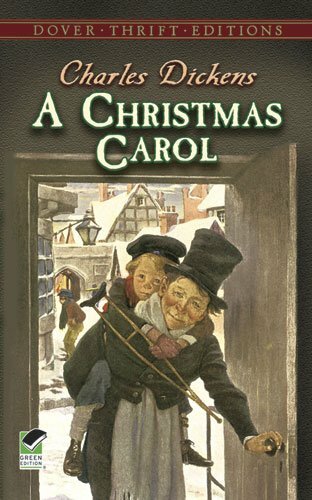 Have you ever read A Christmas Carol, or any other works by Dickens? 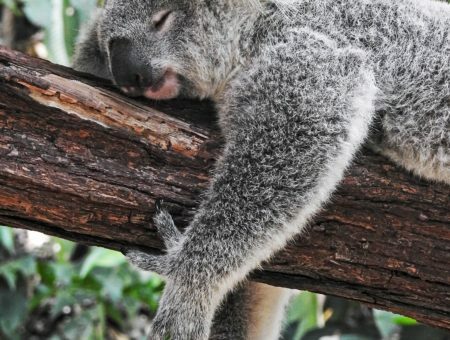 Have you ever seen an adaptation of the popular holiday story, in film or on stage? What’s your favorite holiday movie? Let me know, in the comments below!